I have been a professional magician for over twenty years and performing magic provides my sole source of income. I first became interested in magic as a child and have since turned my hobby into a full time job that has taken me around the world where I have performed my magic as far afield as Dubai and Malaysia. I became a professional entertainer in 1993, a huge gamble at the time but one which over the years has paid off. At first glance it might seem that West Wales, because of the widespread community, was not a good place to start but I very soon found a niche market and the business expanded rapidly. Enterprises like this depend on word of mouth recommendation for growth and success. I soon turned my business into a limited company and was being booked across the world and throughout the UK. For ten years I worked with my partner Lucy who toured with me, performing in shows across the middle east and Europe. The rapid growth of the business meant that both myself and Lucy were spending more time away from home than we were in it and we realised this needed to change. We gradually reduced the touring work and concentrated more on the jobs in South Wales. Soon after this Lucy decided to stop performing altogether as we now had family commitments and she has since taken on the role of business administrator. Over the years, as well as performing at thousands of private engagements, I have performed my magic at the wedding of Coronation Street’s Hayley Cropper. I have also entertained Rhod Gilbert, Rod Stewart and appeared recently on BBC2 performing magic for Abz Love. My business is a limited company and I guarantee my performance with a money back offer if you are not completely satisfied. If you are looking to hire a magician I will travel to any destination and perform at any event, large or small. If you would like to discuss your event or your budget please contact me for an immediate, no obligation quote. I am the resident close-up magician at The National Botanic Gardens of Wales in Carmarthenshire and I am also the resident stage magician and table magician at the 700 seat Follies Theatre in Pembrokeshire. Because of this work I am able to keep my prices for private and corporate magic down to a realistic level which will suit every budget. All bookings are different, there is no set price for my services and the cost will depend on several factors including the number of guests, venue destination and the specific requirements of the event. Organising a wedding or social event can be a stressful and time-consuming task and you need to ensure that it is going to be a wonderful experience for your guests. 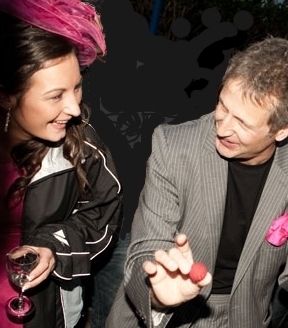 I work as a full time magician and I will be delighted to offer my assistance in the planning and organising of the entertainment at your function if it is needed.